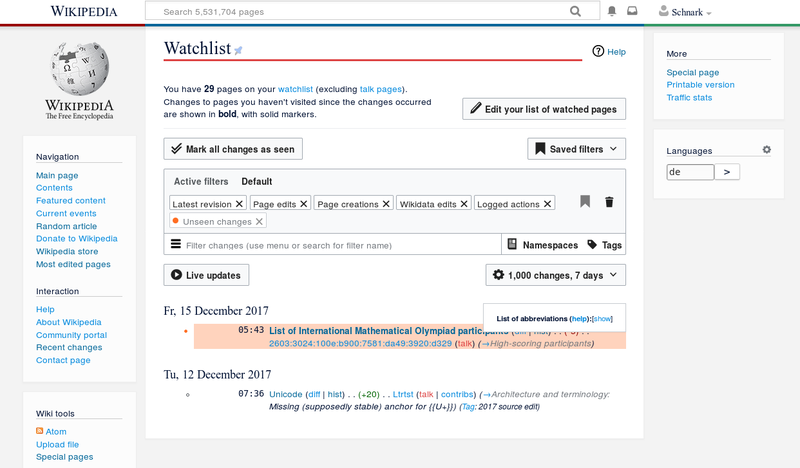 When 'Group results by page' option is used on RC or Watchlist page, the legend overlaps actual result set. FWIW, I can't reproduce this. Have you tried safemode? Also, you say RecentChanges but the screenshot shows Watchlist. I can reproduce on mw and beta.wmflabs (i.e. with 1.31.0-wmf.11) in any skin. Schnark edited projects, added Regression; removed Timeless. Legoktm added subscribers: Strainu, Aklapper. Found it. "Group changes by page in recent changes and watchlist" at Special:Preferences#mw-prefsection-rc causes this. That preference isn't exactly new, though. Looks like this is specific to the Timeless skin? This is actually what's supposed to happen, after this change bc3f4d1b1860. Legend becomes absolutely positioned when grouping results by page is enabled. You can easily see this by clicking button that says "1,000 changes, 30 days" and choosing "Group results by page", no need for preference to see how legend becomes absolutely positioned. The overlap which was not intended (fixed, but not yet in production) is described here: T182269. "Group changes by page in recent changes and watchlist" at Special:Preferences#mw-prefsection-rc causes this. Can you give specific links for ? And yet, it's been ignored in almost every RC update in the last year - I remember at least 2 other bugs that were only reproducible with that setting. T164059; T125858 are the ones reported on the ro.wiki village pump, there might have been others that haven't been reported there. I understand that some of them were done by 3rd party teams, but the team responsible for RC should have the means to catch such issues. Thx, @Strainu I will re-check those task and re-triage them if necessary. T164059: MediaWiki\Linker\LinkRenderer::makeKnownLink() must implement interface MediaWiki\Linker\LinkTarget, null given on Special:Watchlist - some optimization for RC/Watchlist performance has been done; there were no recent complaints about issues related to performance. I need to check more to decide if this ticket is still valid. T29436: Improve the marking of changes when using Advanced recent changes - should be a part of ongoing discussion about improving editor/administrator monitoring workflow. 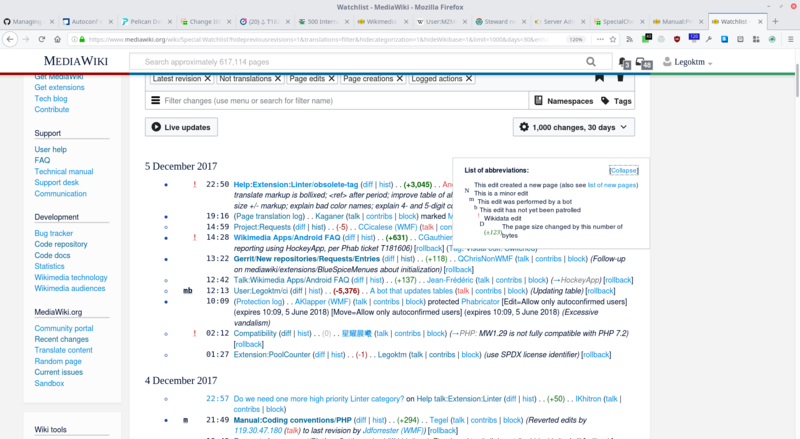 @Etonkovidova, thanks a lot for taking another look at those issues, this is really nice of you :) You might have misunderstood my main complaint, though: the bugs seem to have appeared in production due to a lack of testing with the "Group changes" option when introducing new features (labels, wikidata, etc.) and this situation seems to repeat itself for a while already. The solutions I see is to either have a release criteria for RC-related tasks on the lines of "test with option X, Y, Z..." or introduce automated tests that can detect differences between the output of the RC feed with various options enabled and continuously improve the tests when new bugs appear (aka the better regression I was talking about). The latter seems preferable to me, although it probably requires a significant time investment upfront. Since the issue is not specific to the skin, but specific to the 'Group results by page' option, I am updating the task description and moving it to Collab-Team-This-Quarter workboard. What is the expected outcome of this ticket at this point? I already wrote that overlapping behavior is expected. The thing specific to skin(s) is right alignment of legend (probably different parent with position: relative compared to Vector skin). @Petar.petkovic The expected behavior: the expanded Legend should behave the same whether 'Group results by page' option is enabled or not. Presently, if the option is not enabled, the long lines in the result set will wrap and the legend won't overlap the text. This is the desirable behavior. I know how different cases (with and without grouping) behave. It was done on purpose, because results are displayed differently when there is grouping, compared to case without grouping. That difference in how results are displayed causes different wrapping around the expanded legend. Grouped results don't wrap the same way non-grouped results do, and always leave the white space around the legend, pushing few results sometimes too much. This was changed as part of T174728: "Legend" retains some space if "Group results by change" is enabled. So, as a trade-off, legend is now above results, with a box shadow to indicate so. @Petar.petkovic Having elements overlap for whatever reason makes the page look broken. If there is really no way to solve both bugs, I would suggest that the situation described in T174728 is better than the current one. Even when I collapse the legend, it still overlaps important links. Trizek-WMF added subscribers: IKhitron, eranroz. Yes, there should be straightforward way to revert. I will probably provide reverting patch tomorrow. Checked in betalabs - the Legend does not overlap the result set anymore with the 'Group results by page' option enabled. Trizek-WMF moved this task from To Triage to Announce in next Collaboration Newsletter on the User-notice-collaboration board. Shizhao added a subscriber: Shizhao. This comment was removed by Trizek-WMF. Assuming resolved, per quick tests and T184165: Legend on Recent changes is misaligned and overlaying results on some wikis.